Offering top standard in a well-maintained and serene environment with an excellent 24-hour CCTV and security network, Orchid Hotels is situated along DBS Road, Beside Deputy Governor’s Office, Central Core Area, Asaba, Nigeria. It has a total of 171 rooms encompassing 20 Executive Suites and 151 Standard & Superior Rooms. 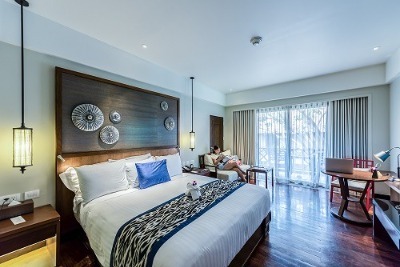 These are comfortable and spacious rooms equipped with top class furniture, full air-conditioning, polished work table, a cable connected flat screen TV, a sofa and an en-suite bathroom. Free Wi-Fi is available at the hotel coupled with a swimming pool, a restaurant, an in-house sports bar and an outdoor pool lounge. Guests can take a relaxing dip in the pool, order light snacks and drinks from the bar while relaxing in the lounge; or taste from the wide options of local and continental dishes the restaurant has to serve. Orchid Hotel has a car park that can accommodate 250 vehicles. A fully stocked unisex boutique is on-site, boasting international quality clothing and accessories. Orchid Hotels has a selection of 18 spacious meeting rooms and a 1,500 sitting capacity events centre which are of international standards. Additional services such as: car hire, laundry/dry cleaning, 24-hour room service and concierge, are rendered by the hotel on request. Children: All children not older than 12 are allowed to stay for free. Q: Does Orchid Hotels offer free Wi-Fi? A: Orchid Hotels offers free Wi-Fi to all checked-in guests. Q: Does Orchid Hotels have a swimming pool? A: There are a swimming pool and a pool lounge in this hotel. Q: Does Orchid Hotels offer complimentary breakfast? A: No. Guests will be charged for breakfast orders. Q: Is there a fitness centre/gym at Orchid Hotels? What type of equipment are available? A: No. A gym is not available at the hotel. Q: Does Orchid Hotels have a restaurant? A: A restaurant is available at Orchid Hotels. Q: What is the check-in and check-out time at Orchid Hotels? A: Check-in and check-out hours are between 2:00 PM and 12:00 PM. Q: Does Orchid Hotels offer car hire services? A: Orchid Hotels renders car hire services on request. Orchid Hotels is a budget hotel in Asaba, Delta. This hotel is a beautiful one and with exquisite design. I am pleased with the customer service I received from the staff. They were very accommodating and friendly. The rooms were clean and beds really comfy. Wow, my stay was short but great and the place is beauiful. My stay at the Orchid Hotels was sweet. I enjoyed my stay at the hotel as the proximity of the hotel to the location of the program I attended was great. The hotel had a large parking space which was nice even though it looked old-fashioned. The environment was very quiet and conducive for relaxation. I would really recommend friends to the hotel as it is very convenient. It was fine but you can always do better. I feel satisfied with what you offered but you can do better. Have nice pictures of Orchid Hotels?